1. If butter is hard, soften by warming in microwave for 4 minutes at 10% power. 2. Cream butter, icing sugar and vanilla together. 3. Add in flour and mix well. 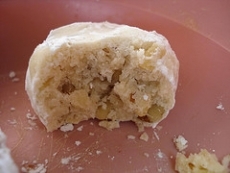 Add in nuts and continue mixing until a smooth dough forms. 4. Roll into 1-inch balls and place about 1-1/2 inches apart on an ungreased cookie sheet. 5. Bake at 350 deg. F for 15-18 minutes Allow to cool on cookie sheet for about 2 minutes, then roll immediately and carefully in icing sugar.